After she lost her sister Kym to cancer 12 years ago, Bingara woman, Leanne Kilmore has been a tireless campaigner raising money to fund research into this insidious disease. 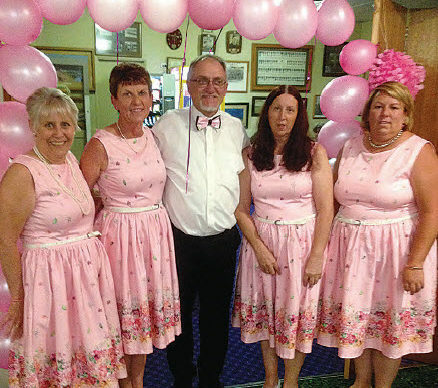 Leanne Kilmore (2nd from left) and friends at the 2017 “Pink Night”. For the past seven years, she has been holding a ‘pink night’, and this year, she has organised Saturday, October 13, to continue her good work. Leanne is hosting a pink night at the Bingara Sporting Club from 6.30pm. DJ Steve will provide entertainment. Lucky door prizes and a raffle will be drawn on the night. Wear something pink, and come along and help Leanne raise money for cancer research. Seven years ago, Leanne held her first ‘pink night’ in her own backyard, but every year since then, she has held the event at a venue. Leanne began by taking part in Relay for Life at Muswellbrook. The next year, she hosted a Biggest Morning Tea at Wingham. “I missed my first year after moving to Bingara as I didn’t know anyone,” Leanne said. That quickly changed, and each year, her ‘pink nights’ have grown.